Made with 100% Pure Herbs, no colors, no preservatives, no chemicals added. Externally: Gently rub the "White Away Salve" on the affected skin spots once or twice daily. When spots become red - stop using (to not get blisters), wait few days, until redness disappears, if discoloration is still visible, start using it again. For baldness put on the scalp, as above. 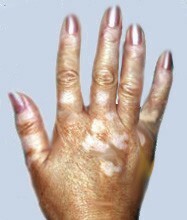 Vitiligo is a skin condition resulting from loss of pigment; white discoloration/depigmentation, the milky white patches can appear on any part of the body. The pigment responsible for skin color is called MELANIN. When cells are not able to produce melanin, white patches are clearly visible. The condition does not seam to harm the body but it produces big stress and psychological discomfort, especially among children and teen-agers. Traditional medicine, does not seam to be able to cure or to control this condition. They say over 1% of population is affected by this condition. On the Internet there are hundreds of "support groups" around the world, with a lot of info on the subject. 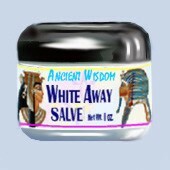 White Away Salve is prepared in accordance with the Ancient Formulae. It is 100% pure herbal combination in 100% pure coconut oil, no colors, no preservatives, no chemicals added. The formulae has been known and used in Middle and Far East for generations. It has been used for skin discoloration, for leprosy, baldness, eczema, skin rashes, hemorrhoids, and many other skin problems externally, and internally, etc.